It’s difficult to come up with a list of 10 Best Beaches in Puerto Rico since it has at least 300 beaches and they are all very beautiful. Puerto Rico may be known for many things, but one of the major reasons why people visit the island is because of its beaches. This popular holiday destination is blessed with 270 miles of beautiful coastlines and boasts of at least a beach per mile. The incredibly warm and sunny weather throughout the year means it’s always a beach day. Disclaimer: There are affiliate links contained within this article which could earn us a commission if any purchases are completed. 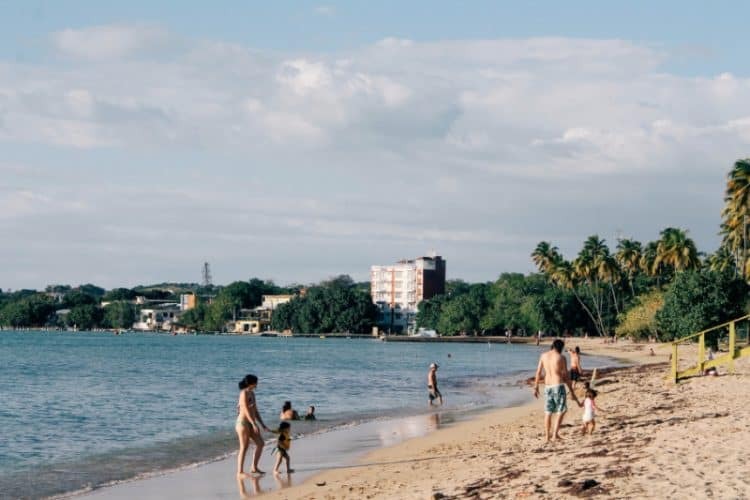 Luquillo beach is one of those gorgeous tropical beaches with everything from swaying palm trees, powdery soft white sand, and crystal clear turquoise water. Also, the beach is perfect for swimming, snorkeling or just wading around thanks to its warm shallow crystal clear waters. Set in the scenic east coast of PR with El Yunque tropical rainforest as a backdrop, this beach is guaranteed to take your breath away. 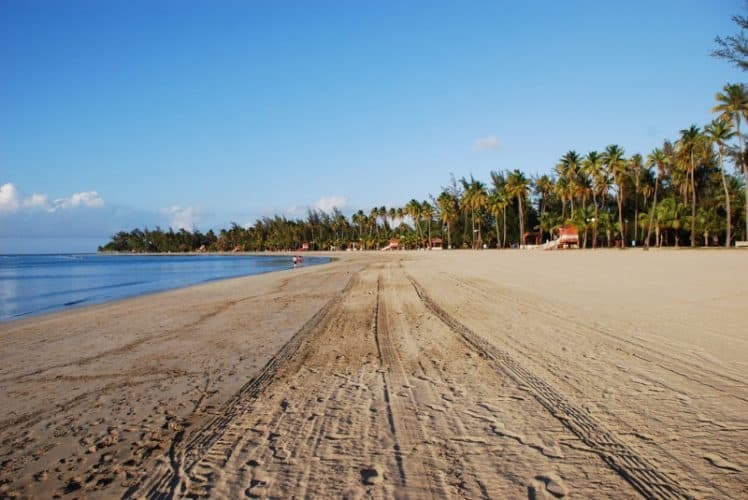 It’s one of the best family-friendly beaches in PR. The shallow waters and the presence of an offshore reef ensures minimal to zero wave action, making it very attractive to families with young kids. The beach also has adequate facilities. There are lifeguards, food kiosks, bathroom, showers, watersport rental shops, and beach-accessories stores. You can get there by taxi or rented car which will take you approximately 45-50minutes. The beach has paid-parking for $5.5. 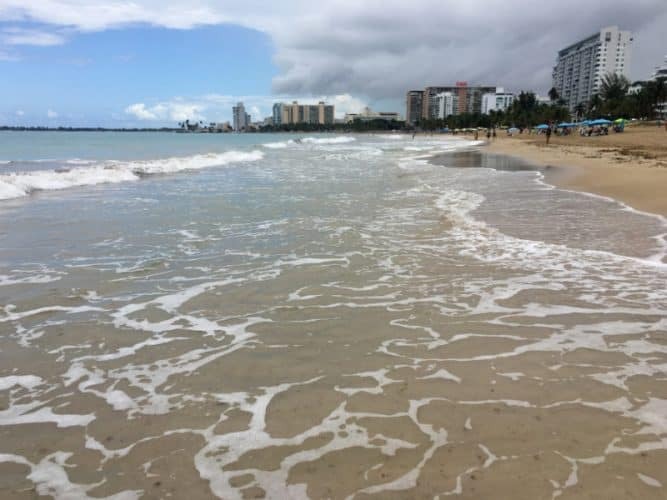 Isla Verde is arguably the best beach in the Metropolitan district of Puerto Rico. Maybe even the best urban beach in the entire Caribbean. It’s found in the resort-lined side of the town and features a long, wide, and slightly curving golden sandy beach. Isla Verde meaning Green Island is just that, the beach is lined with tall swaying palm trees. It has all the necessary amenities, starting with paid parking, restaurants, bathrooms and showers. You can rent chairs, umbrella and watersport gear. The crystal clear waters of this beach remain warm all year and just beg you to take a refreshing dip in them. Isla Verde is wide enough that there is plenty of room for just about everyone. To spice up the beach routine, you can go Jet skiing, banana boat riding or do standup paddleboarding. Escambron beach which is also known as Balneario del Escambron is located a short walking distance from Old San Juan. This beach offers something for everyone. Thanks to the protection of an offshore coral reef, the waters here form a giant outdoor saltwater pool. Perfect for swimming, floating, playing and snorkeling in. The beach is divided into three smaller beaches with each beach representing the needs of a particular group. The small beach is perfect for families with kids. The furthest beach is great for snorkelers, and the middle beach is just good for everyone even romantics. Escambron is found near the interesting attractions of old San Juan, such as the Bateria Del Escambrón and Munoz Rivera Park. Pack your beach supplies and head over to Escambrón. This is the best way to escape the hustle and bustle of the city but still be near enough in case you wish to take a break. Go early and pick a shaded spot under the numerous palm trees on the beach. When you get hungry, just cross the streets to one of the many available eateries. 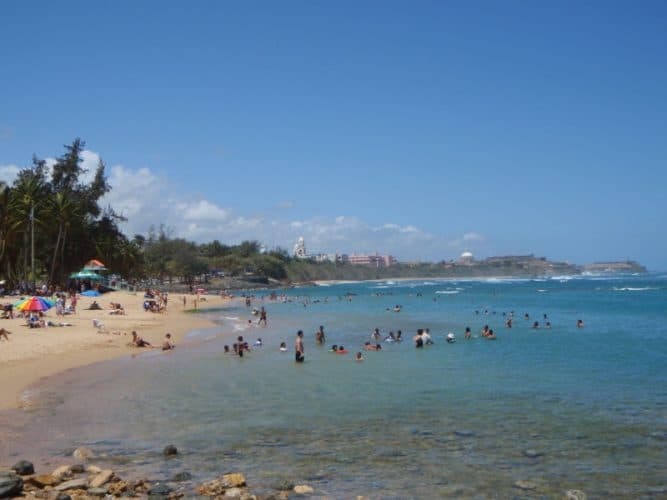 Condado beach is a resort-lined city beach found east of Old San Juan town. It’s a lively and very busy beach. This is where you want to go to experience for a beach party atmosphere and interact with people while being a stone’s throw away from downtown. This long golden sandy stretch of beach is perfect for sunbathing, people watching, walking and jogging. There are plenty of high-end resorts along the beach where you can grab lunch at and refresh with cold Pina Coladas. Swimming isn’t recommended, though, as there are rough waves and strong currents in the water. It is after all on the Atlantic side of things. 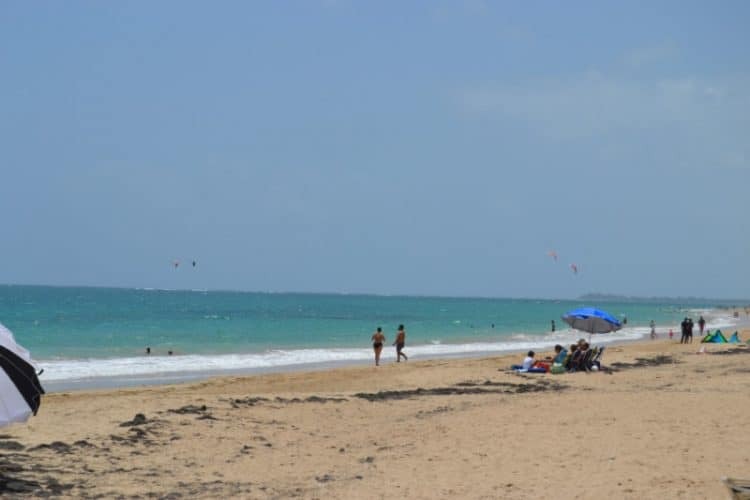 Ocean Park Beach found in San Juan is a laid back, wide stretch of soft golden sandy beach. It’s perfect for long walks, jogging, and sunbathing. This beach is set against the rough waves of the Atlantic creating the perfect environment for wind and body surfing. Watching the waves crash on the beach as the surfers do their thing is amazingly therapeutic. Go with a book and enjoy a great time catching some rays and people watching. 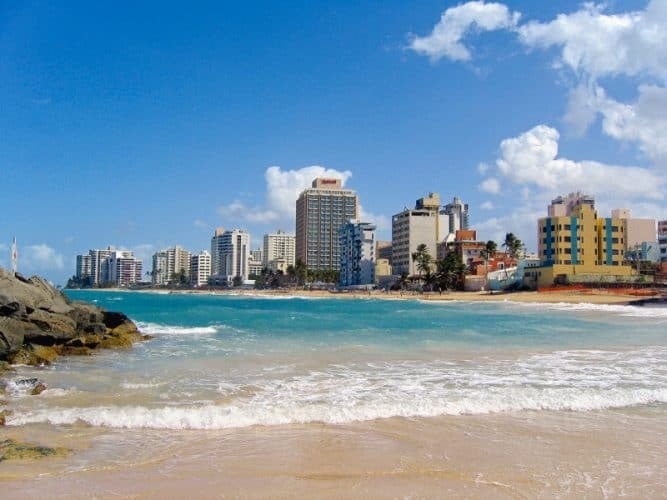 This beach is also the quieter of San Juan’s beaches and is a bit hard to find due to the high-rise waterfront buildings separating it from the town. The waves here range from mild to strong so best be a strong swimmer to attempt swimming on this beach. If you get hungry, there are plenty of eateries across the street where you can grab a bite and a refreshing drink. 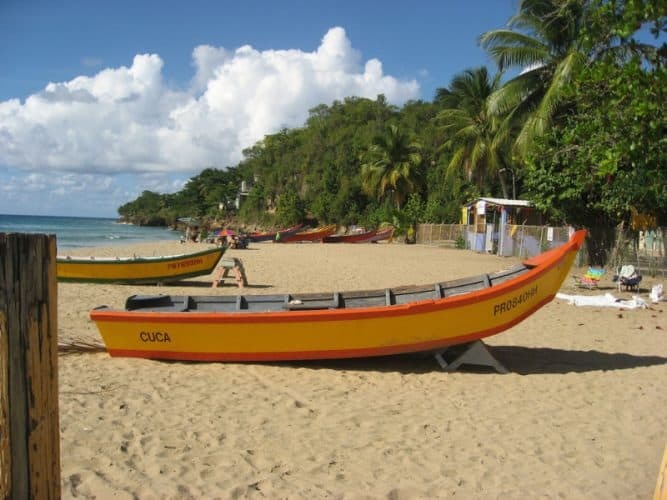 Boqueron is a laid back island style beach off the beaten path of the western coast. This 3 miles long stretch of light golden sand is perfect for a lovely day on the beach. The sand here demands you lay on it while the crystal clear blue waters beg you to go in for a refreshing dip. It’s no wonder this beach bears the coveted Blue Flag status. The driveway, however, is closed due to damage caused by hurricane Maria, meaning you have to walk a bit to get to it. But don’t worry, the walk is through a beautiful piece of nature with mangrove and lagoon in the area. There are clean bathrooms and food vendors, and it’s still an awesome place just requires a bit of clean up. In the rugged northwestern tip of Puerto Rico is the district of Aguadilla. A surfers, adventurers and photographer’s paradise. This hilly side of Puerto Rico is known to have the best views of the Atlantic and the best Atlantic side beaches. Crashboat beach is one of those beaches and is arguably the best in Aguadilla and probably on the entire west coast of Puerto Rico. It’s named Crashboat supposedly because of the fisherman boats docked on the beach which look as if they crashed there. Crashboat is a lively-colorful beach where you can swim, sunbathe, or take part in interesting watersports. Thanks to Hurricane Maria the beach now features pristinely white sandy beach with crystal clear turquoise waters. Perfect for all manner of beach activities. However, always exercise caution in regards to swimming in certain areas especially around the pier– which is known to have strong currents. Speaking of the pier, one of the most common activities on this beach is pier diving. It’s a good place to see fish living around the pier’s columns. The beach has bathrooms, food vendors, chairs and umbrellas rentals. It takes roughly one and a half hours to get to the beach from San Juan, and there is paid-parking if you have a car. One of the most breathtaking beaches in Puerto Rico has to be Sucia Beach. If you are looking for a secluded slice of paradise, then this is it. Located in the dramatic green coast of the south of the island at Cabo Rojo, Sucia is the perfect beach to get away to. You can lie down on the soft white sands or jump into the refreshing crystal clear blue waters and enjoy your day there. This beach has plenty of shade but zero amenities and thanks to that it remains unspoiled. It’s a bit far from San Juan, and a 2.5hrs drive is required to get there. It’s a better visit if you are in Cabo Rojo. Apart from sunbathing, swimming, floating you can hike the surrounding hills especially to the Los Morrillos lighthouse which gives splendid views of the beach and the Caribbean horizon. 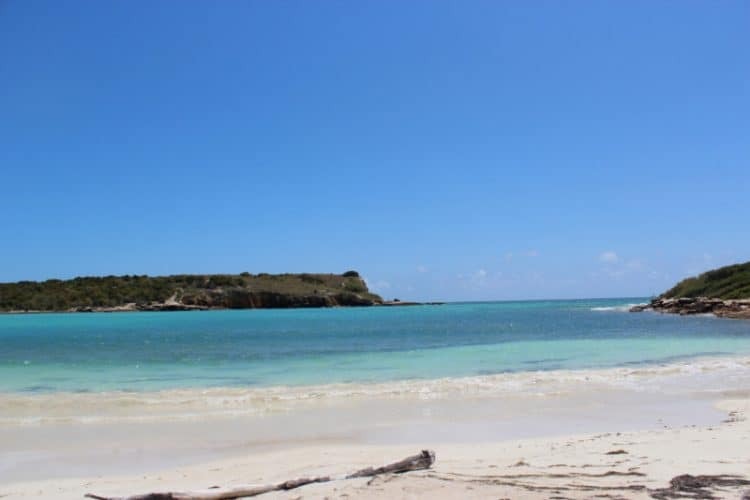 Mainland Puerto Rico is not short of beaches but if you want to check out what an unspoiled tropical paradise beach looks like then hop on a ferry or a seaplane and head over to Vieques. Vieques is one of the sister islands of Puerto Rico located just 6 miles off its southeast coast. 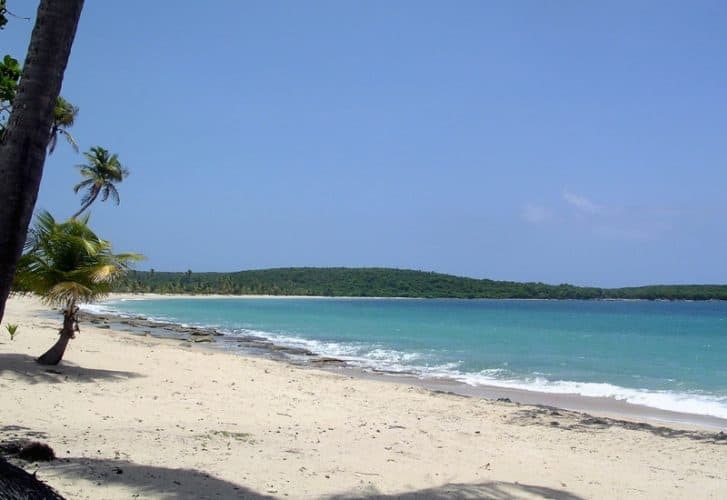 Sun Bay is the longest beach, and it’s the only beach with amenities on the island of Vieques. It’s a postcard-perfect tropical beach with swaying palm trees against a lush backdrop with a mile long of soft white sandy beach with crystal clear turquoise waters. It’s gorgeous and makes for the perfect beach getaway on a day trip from the main island. It has ample parking. Keep an eye out for the wild horses found in the area. They are your welcoming party to the beach– which is another interesting thing about this place. The restaurant in the area is best known for its coconut infused Pina Coladas. Some people make a visit to Puerto Rico just for Flamenco Beach. That should tell you how beautiful this beach is. Flamenco beach is a world-renowned beach which has severally been named one of the world’s top beaches. It is located in Culebra Island (Puerto Rico’s Sister Island) 20 miles of the northeast coast of Puerto Rico. Flamenco features a mile-and-a-half-long wrap-around-stretch of soft, white-sandy-beach with clear sparkling turquoise waters. This postcard-perfect tropical beach paradise is set in a picture-perfect scene with swaying palm trees lining the beach against a lush, hilly background. The waters on this beach are calm and gentle, perfect for swimming, snorkeling or just playing in the water. Flamenco is the perfect beach getaway for any age group. It’s family friendly, beloved by honeymooners and great for adventurers. It has plenty of amenities, including paid parking, clean bathrooms, showers, chair, umbrella, and watersport rentals. 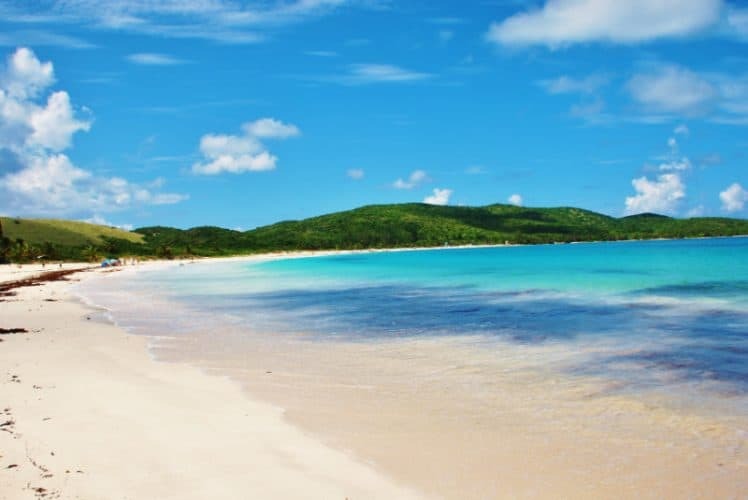 Flamenco beach is a must visit while in Puerto Rico. To get there, you have to take a 50minute ferry ride or an even shorter ride by airplane. See You on Puerto Rico Beach! There you have it, 10 of the best beaches in Puerto Rico. Some city beaches are included in here not necessarily because of their appeal, but because of their accessibility. 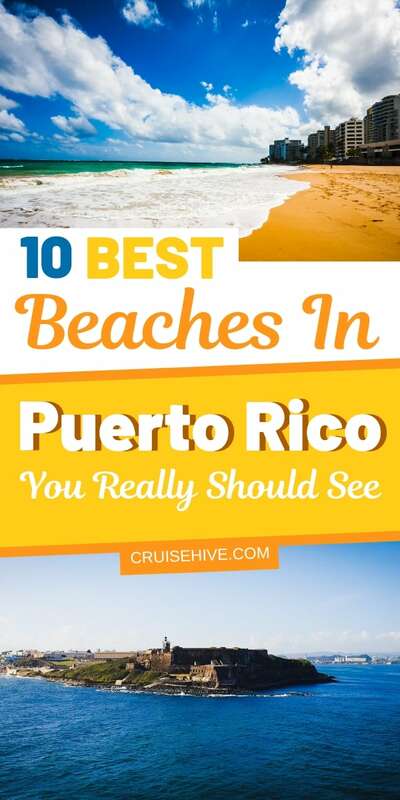 Remember this list is just a scratch of the beaches available in Puerto Rico. There are many more amazing beaches on this island. From healthy coral reef beaches such as Tamarindo to the quintessential Playa Negra or Black beach where the sands on the beach are black. You are therefore not limited to this list; you can go explore and find other beaches you might like better too. Just remember to carry good water shoes (some beaches are rocky), pack biodegradable sunscreen, your snorkel gear, and a hat or sunglasses. Cruise Hive readers can get everything needed for a Caribbean cruise right here. That’s it from us here. We wish you a wonderful beach vacation in San Juan and all of Puerto Rico. Happy Cruising! !